The 22,000-square-foot museum is a multiple volume, single-level structure clad in zinc panels and French limestone. A large, naturally lit sculpture gallery is the organizing element for a sequence of 18-feet-high gallery spaces with state-of-the-art museum environmental controls, and an administrative office suite. The sculpture gallery is also the gathering space for receptions and special events and opens onto a terrace overlooking the pond and grounds. Support space to one side of the galleries includes high-density art storage, temporary holding space, a service dock and a catering kitchen. 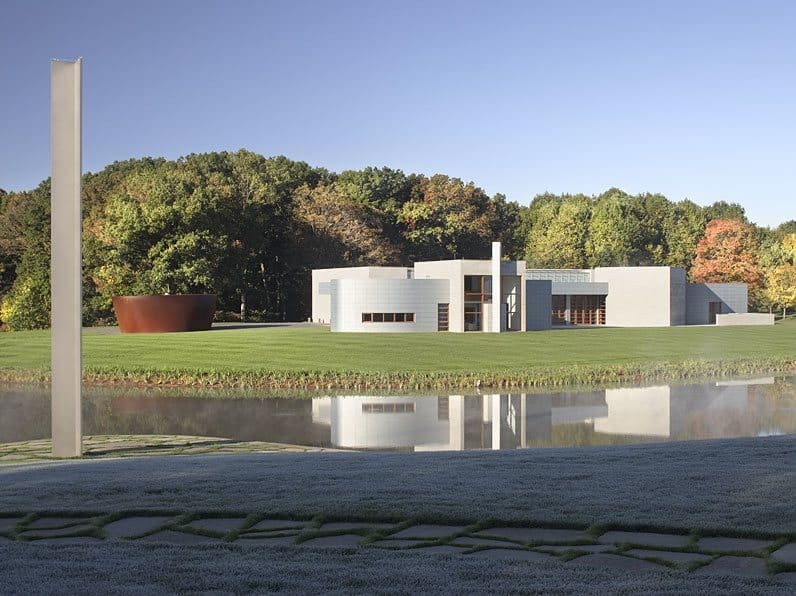 Visitors to Glenstone must first pass through the entry gatehouse, then drive along a maple tree-lined road, passing between two commissioned sculptures by Richard Serra and Tony Smith. The cobblestone entry court, anchored by another Richard Serra piece, has views of the pond and a commissioned Ellsworth Kelly totem sculpture which acts as the site’s fulcrum.